Audi is taking its showroom concept for premium car sales to the next level: The fifth Audi City worldwide is opening in the heart of the Polish capital. The brand with the four rings is presenting its entire product portfolio to visitors in virtual form and with personal consultation on an area of around 530 m2. At the same time, the latest offering is profiting from the experiences of existing Audi Cities. 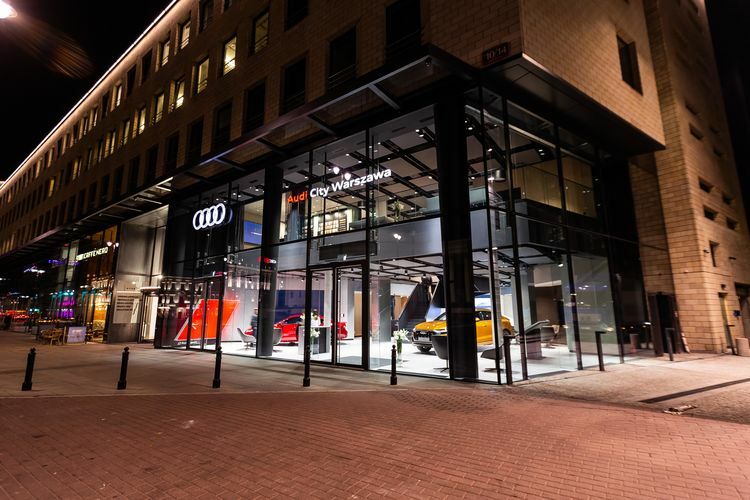 Audi Cities have been bringing innovative showrooms to top city-center locations in major international cities since 2012. They combine digital sales with the strengths of the stationary retail trade. This combination of a cyberstore and showroom already exists in Berlin, Istanbul, Moscow and Paris. “Audi is a pioneer in the digital sales experience. We have continuously developed the concept of the Audi City and made it even more appealing and efficient. We are now presenting the latest result in Warsaw,” said Horst Hanschur, Head of Sales Strategy at AUDI AG. The two stories of Audi City Warsaw showcase the new interior concept: Here, all of the contents are presented even more compactly and flexibly. As a result, the cars on display come into focus more, while virtual reality also plays a key role. A digital configuration of a customer’s dream Audi, including all special equipment and customization options, can be created at various stations and viewed using VR headsets. Two fully digitalized modules, called Customer Private Lounges, provide the conditions for a personal consultation in a private setting. The latest development stage of the pioneering sales concept is also becoming far more efficient: Energy consumption as well as the costs for hardware and operation have fallen to a quarter.